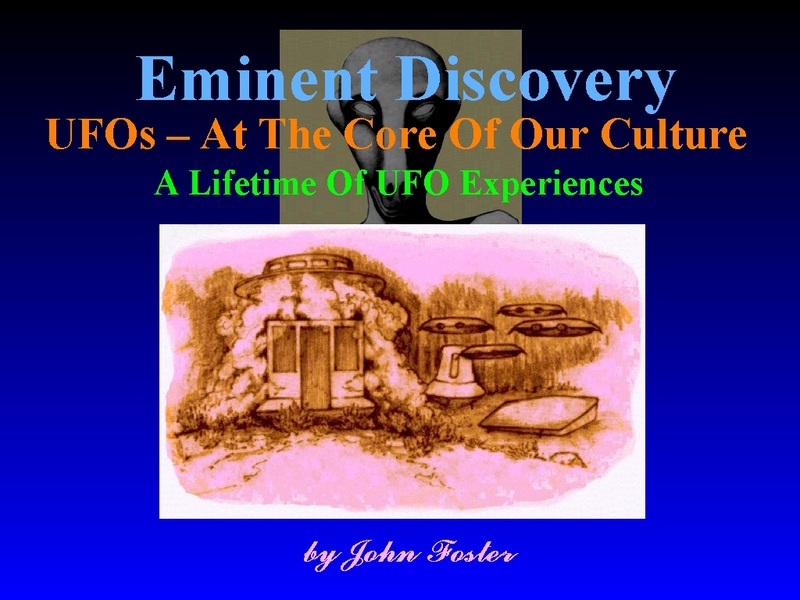 A new upgrade publication of the book “Eminent Discovery, a lifetime of UFO encounters” is available: Please click below! Amazon.com paperbacks and Kindle ebooks are available. The abundantly illustrated Kindle ebooks are formated in fixed page text that can be read on Kindle readers, most tablets, and phones. The text is not flowing. This provides a much better read and an outstanding presentation of the many drawings and photos. Contact jafos111@gmail.com for signed copies! They will be available after 3-20-19. Paperback $14.95 Click here to purchase from Amazon.com! Kindle ebook $9.95 Click here to purchase from Amazon.com! ♦ Read Eminent Discovery Illustration Picture Book to get a general visual and written overview of the amazing things that happened. ♦ Read Eminent Discovery to understand more deeply what happened and how it happened. Eminent Discovery was written for the record. ♦ Read To Earth From Heaven to discover what it all means and might mean. To purchase the books, contact John at jafos111@gmail.com or click the title. ***Eminent Discovery Illustration Picture Book — This very unusual true story is briefly told through 170 excellent freehand drawings. 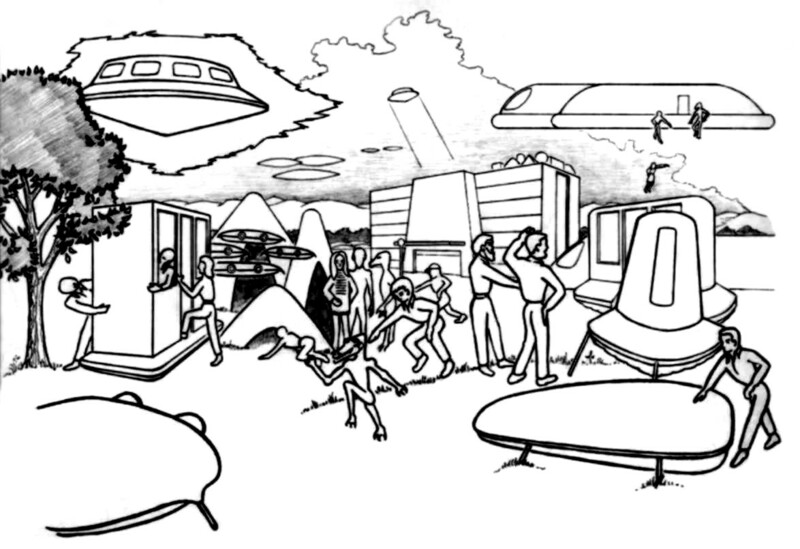 The drawings represent what author/artist John Foster and those who were with him actually experienced during the many strange UFO encounters that occurred throughout his life. The drawings include short comments that convey to you what happened, where and when it happened. — Kindle version $7.95, Paperback $9.95. *** Eminent Discovery is the primary book that reveals John’s Eminent Discovery in some detail. It includes over 140 of his drawings and many narrations conveying to you some of the unbelievable episodes that mysteriously and unexpectedly confronted John and the other people who were with him for more than forty six years. The encounters occurred from the time he was born in 1937 until he was 48 years old. He briefly compares what happened with modern and ancient science, religion, and history. This story strongly supports the Ancient Alien hypothesis, as well as other modern so-called UFO encounters. The Forward is by R. Leo Sprinkle, PhD (Professor Emeritus/researcher/experiencer) – The Psychological Opinion is by Fowler Jones, PhD (Professor Emeritus/researcher) – Comments From Others in Appendix A are by Donna Henriksen, PhD (Professor Emeritus/researcher); Bob Teets (writer/editor/researcher/experiencer); Donald Ware, MS (renown researcher/experiencer); Wendell Stevens (renown researcher); Joe Lewells, PhD (renown researcher/experiencer); and Annie Foster (wife/experiencer) – Comments From Witnesses in Appendix B are by Bob Collingsworth (pseudonym/experiencer), Karen Beaman (daughter/experiencer), Kindra Foster (daughter/experiencer), and Brad Foster (son/experiencer). — Kindle version $9.95, Paperback $19.95. *** To Earth From Heaven continues with other encounter narrations. John rationalizes and speculates more thoroughly about what it all means…and what it might mean — Kindle version $9.95, Paperback $15.95. …spoken by John Foster and by many credible experts in various fields of understanding. This is a true story that critically affects our basic understandings of life on earth. If investigated thoroughly, it can enhance our modern concepts of science, religion and history. It can enrich our present personal lives and our lives in the future…even beyond death! For a more thorough introduction to the story see the videos of John’s talks to the 2001 International UFO Congress Convention and the 2000 Ozark UFO Conference below. For additional information read below, click the items in the black strip above…and click in the right hand column for related articles, related links, a slide show of John’s UFO drawings, radio blog interviews, and TV video interviews. When I was young… How it all began…..
“When I was very young, about two or three years old, I sometimes would play on the sidewalk, at the corner, in front of our house. And at times I felt excruciating forces on my body and mind; I could hardly move. Hearing roaring sounds above me, I struggled to look upward. I sometimes saw the craft (disc-shaped craft) hovering and moving slowly several yards above me in the fog or haze. And I sometimes heard a voice talking, at times to me about something I could not understand. After I gain control again, I would run to the house to tell my mother. For a better understanding of the “UFO Contactee experience” view Bob Dean’s video immediately below. Many people have suffered and benefited as he has described it. He has arrived in a good place. It is one of the best explanations I’ve heard. If you don’t want to know, don’t watch it. Believe it or not, this video credibly represents in some detail what others and I saw concerning the disappearances, movement, and appearances of the crafts, objects, men and beings over a period of 46+ years. See the article featuring this same video below for an explanation of the disappearances, movement, and appearances of these crafts and the crafts others and John saw on many occasions over a period of 46+ years. This story literally is mind boggling! Written by John Foster January 5, 2018…. I believe it is so important, I have devoted the last three decades of my life trying to understand what actually happened and how it affects our human culture, from our very beginnings. I have written three books concerning what most people understand to be UFO encounters. More specifically the books give you detailed information concerning my and others’ so-called UFO encounters that we experienced together. 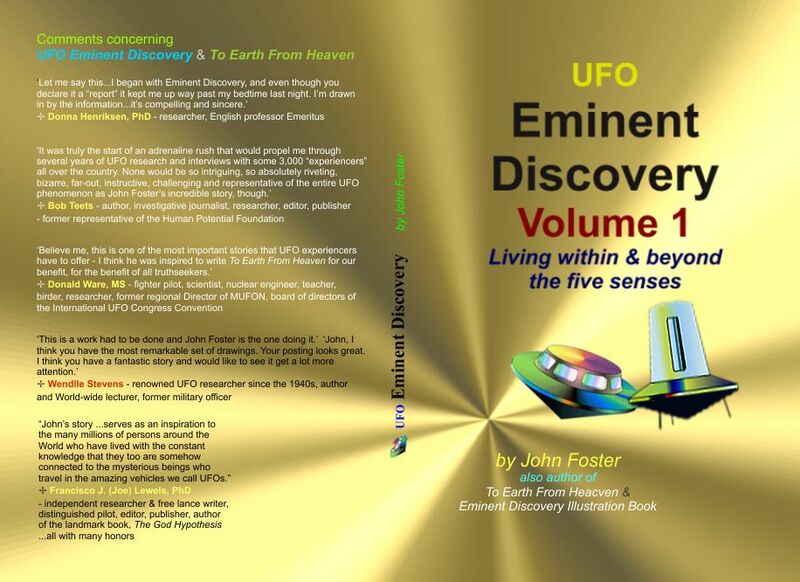 The first book is titled Eminent Discovery – a lifetime of UFO experiences. It consists of about 360 pages. It took me 14 years to complete. This was because of the immense amount of information I received from what I call “a flood of recollections” in 1986/1987. My recollections were related to actual but clandestine UFO encounters those other people and I had experienced since a couple of years after my birth. I was born in 1937. Most of us mysteriously forgot most of what took place during the encounters. But several of the others and especially I could remember some strange things that had occurred during those 46+ years. My flood of recollections was completely overwhelming. I nearly died from massive heart attacks and heart surgery, other serious health problems and surgeries. This was after I established without a doubt that my memories were true and accurate, after I was asked to go public with my story. I was somewhat totally shocked and devastated for about ten years. My doctors told me I could die at any time for about ten years, but I was asked to give some public talks and give interviews to some major and minor newspapers, TV and radio programs from time to time. My first book Eminent Discovery explains what happened and how it happened in some detail. I wrote it for the record. Included in the book are more than 140 illustrations that represent what the others and I saw during the encounters. I wrote the second book To Earth From Heaven to explain more about the complexity of the encounters and to give you a more enlightened understanding of what UFO encounters actually are. Included are detailed descriptions of several unusual characteristics of the encounters so that you can see how the encounters have affected our human lives since the creation of humankind. Because the story was (and still is) so complex and lengthy, I wrote a smaller third book called Eminent Discovery Illustration Picture book. Included are more of my drawings that represent what the others and I visually witnessed during the encounters. Short comments explain briefly what happened, where and when. You can order the books from Amazon.com or by clicking in the black strip menu above. Or you can request signed copies from me by making a comment below under “comments.” The books are offered in paperback or ebook formats. I offer them to you and expect to make no money. I have sacrificed thousands of dollars and thousands of hours – my good health and my professional life – so I can simply understand what actually happened and so I can pass this life-changing astonishing information on to you. If you are destitute and cannot afford the price of the books, please let me know through “comments” below. Written by John Foster January 3, 2018… I definitely know that this story is true and accurate as I have described it here, in the video interviews I’ve given, and in the books I’ve authored…just as real as you sitting there reading today, and as real as me, right now, writing. Several witnesses clearly recall parts of a few of my (our) strange UFO encounters where they all saw the crafts, objects and/or lights. Two recall hearing the voice speak to us, one from thin air and a strange object and the other from a brilliant light or illuminated craft. I recall all of these incidences in detail. Therefore it is established for me and those witnesses that the strange crafts and strange objects were indeed real and that the voice also was real. I saw and heard the same as they saw and heard, as well as much, much more. This without a doubt establishes the fact that the crafts, objects and voice were real, most likely in our three dimensional reality as we recall them being real. Still other witnesses recall mysterious crafts and lights as I recall them. This along with many other similarities related to the modern UFO experiences of other people and with many similar strange happenings that have been described throughout written history, especially mysterious happenings that are described in The Bible, indicates strongly that those mysterious historical happenings most likely occurred very close to what has been described, just as it was written or very close to what was written. I have been very careful to write and convey all of the information here and in my books and videos accurately, especially because I feel other humans should have a great need to know about it, especially at this time…a time when our human culture is progressing technically, and in many other ways, in leaps and bounds. This is an obvious indication that we are being influenced in a variety of ways from beyond our simple five senses. I essentially have been told verbally that they are once again here to improve us as human beings, before we destroy ourselves.